A person can travel in all sorts of ways. My husband Klaus and I are happiest when travelling independently with chances aplenty for spontaneous decisions. One such decision in Patagonia took us on a small detour to Tierra del Fuego to visit the only colony of king penguins living outside of the Antarctic. We didn’t dare rent a car at the time because the way was long and unknown to us. Instead, we joined an organised tour and travelled with the ferry across the Strait of Magellan and with a minibus along the bumpy roads through the vast, flat grassland. Nowhere was a settlement, a house or even a tree to be seen. Hours later we reached our destination: a wooden cabin in the middle of nowhere, a signpost and a path. We made our way silently and a little excitedly in the direction of the ocean. And then we saw them! 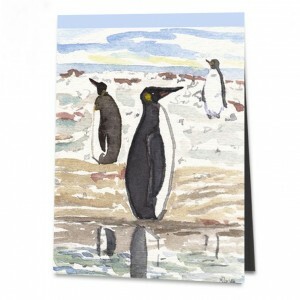 The king penguins stood, quiet and motionless, in small groups in tall grass on the far side of a small brook. Our presence didn’t appear to disturb them in the slightest. We lay and crouched in the grass. No one spoke a word. The majestic composure of the animals pulled us under its spell. On one occasion, one leisurely took a few steps; on another, one bent its head back, opened its beak and released a lengthy, rattling cry. Nothing more happened. While I continued to observe and marvel, the cameras had already begun to click. As I unpacked my art equipment, the group had already moved on to the next spot. And as I finally wanted to begin my picture, Klaus whispered to me that I had to hurry because the 20 minutes planned for this site were almost over. So I drew the beautiful animals with a broad brush and in a great hurry. While doing so, I felt wonderfully calm, truly happy.